You can get to Brighton from London in less time than it probably takes you to get home from work. The seaside town often called London's Beach, has a magical pier, quirky shopping, the extravagant Royal Pavilion and, of course, miles of pebbly shingle beach. But its newest - and coolest - attraction, the British Airways i360 should definitely put Brighton on your must-visit list. Use these information resources to get to plan your journey to Brighton by various forms of transportation. If you're fit and up for a challenge, you might even try cycling. It's less than 60 miles. Brighton is 54 miles due south of London. It takes about 1 1/2 hours to drive. South of the M25 ring road, the M23 leads into Brighton. This is an easy but very popular route. Lots of Londoners take day trips and short getaways to Brighton. Visitors from France, through the Channel Tunnel also like Brighton's arts, antiques, and gay scenes. All this means that you can expect plenty of traffic at popular times. There is good municipal parking in Brighton - covered and underground car parks where you can leave your car out of the sunlight for most of the day for a relatively reasonable price. If you drive, keep in mind that gasoline, called petrol in the UK, is sold by the liter (a little more than a quart). The easiest and fastest way to get to Brighton is by train. 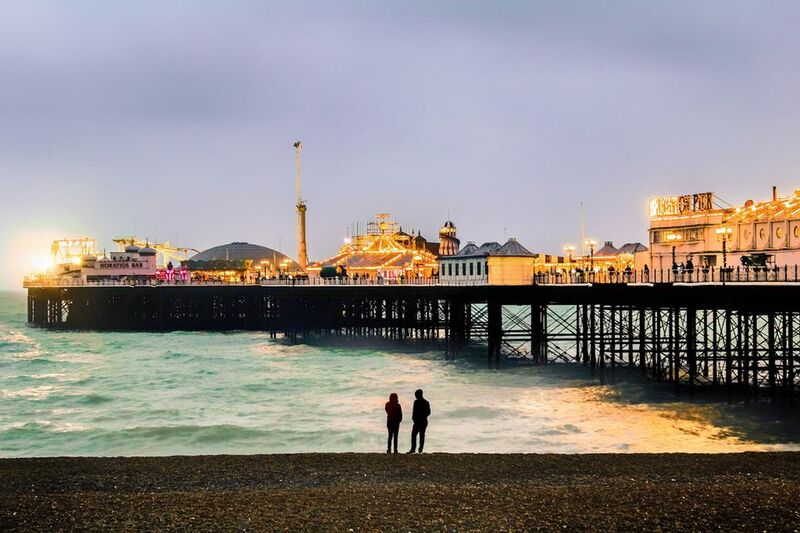 The 54-mile trip usually takes less than an hour and trains run from very early to very late - so if you get caught up in the party animal side of Brighton, there's a good chance you'll still be able to catch a train back to London. Thameslink and Southern Trains run frequent trains to Brighton Station from London Victoria, London Bridge Station and St Pancras International throughout the day and through most of the night. The journey takes between an hour and an hour and a half depending upon the service you choose. If you plan well and book your tickets for about two weeks in advance, you can save quite a bit. If you can be flexible with travel times, use the National Rail Enquiries Cheapest Fare Finder to get the best deals. National Express run coaches from London to Brighton. You can save quite a bit but plan on warming a bus seat for at least an hour longer than if you had taken the train. Journeys take from 2 hours 20 minutes to 3 hours 40 minutes. There is one, fast trip each way that takes two hours but most coaches take considerably longer. Buses travel every half hour between Victoria Coach Station in London and Brighton Coach Station. Some services have Wi-Fi to help you while away the time. UK travelers tip: Bus tickets are usually sold as one way journeys with each leg of your trip priced differently, depending upon when you travel. If you are flexible about travel time you can usually save more. Bus tickets can also be purchased online. There is usually a booking fee.